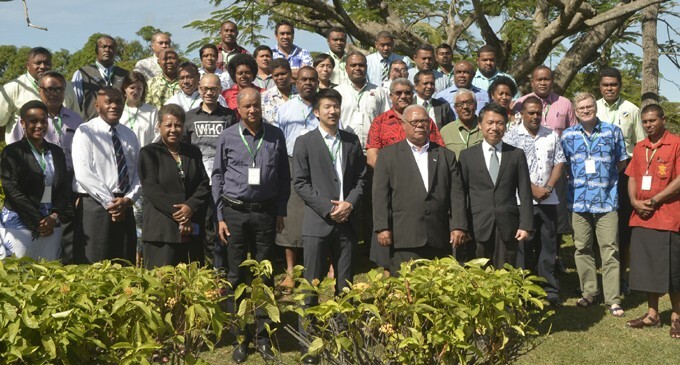 As momentum builds ahead of the World Humanitarian Summit in Istanbul, Fiji businesses have agreed to join forces with the Government, United Nations and civil society organizations to establish the Fiji Business Disaster Resilience Council. “Tropical Cyclone Winston has clearly demonstrated that businesses are both an integral part of communities impacted by disaster and are major contributors to response and recovery in those communities,” Howard Politini, Vice Chair of the Pacific Island Private Sector Organisation, said. The Fiji Business Disaster Resilience Council will work to support businesses to withstand and recover from disasters, as well as strengthen their engagement in emergency response and recovery efforts in collaboration with the Government, the United Nations and civil society. The Council will be hosted by the Fiji Commerce and Employers Federation and supported by the Pacific Island Private Sector Organization. Among those present at an initial planning workshop in Suva were Goodman Fielder, Vodafone Fiji Ltd, Vinod Patel Ltd, Digicel, Westpac Banking Corporation, Bank of South Pacific, Coca Cola Amatil, Fiji Electricity Authority and DHL Express (Fiji) Ltd. Representatives from the Philippines Disaster Resilience Foundation, a private sector network of Philippine companies, attended the meeting in Suva, Fiji to share their experiences and support the Fiji Business Disaster Resilience Council. “Private individuals and organizations have been some of the largest donors to the Cyclone Winston response and it was great to see such high level engagement at the planning workshop. This initiative has already been successful in engaging with businesses in the Philippines and we would encourage any Fijian businesses who are interested in this work to get in touch and get involved,” Rene Meily, the President of the Philippine Disaster Resilience Foundation said. The Fiji Business Disaster Resilience Council will be part of the Connecting Business initiative, a global multi-stakeholder project that is jointly led by the United Nations Office for Disaster Risk Reduction (UNISDR), the United Nations Office for the Coordination of Humanitarian Affairs (UNOCHA) and the United Nations Development Programme (UNDP). The Connecting Business initiative will be launched at the World Humanitarian Summit, 23-24 May 2016, Istanbul, Turkey, where the Fiji Business Disaster Resilience Council will be showcased. The Connecting Business initiative is working with private sector-led networks around the world, including the Philippines, Madagascar, East Africa, Myanmar, Sri Lanka and Haiti.